In the period just before the U.S. became involved in the Second World War, the U.S. Navy Bureau of Aeronautics revealed itself as as a less moss-covered organization than it had been previously, when the U.S. Navy became one of the last air forces in the world to order a biplane into production as a fighter, that being the Grumman F3F series, which entered service at the same time as the Bf-109, the Hawker Hurricane and the Supermarine Spitfire. Among radical designs like the Grumman F5F "Skyrocket," the Chance-Vougt entry for a fleet air defense interceptor must surely hold the record for eccentricity in design. Known as the "flying flapjack", the airplane has also been considered as a possible source for reports of UFO "flying saucers," given its unorthodox configuration; unfortunately for the X-files crowd, the XF5U-1 never flew, since its prolonged gestation saw it overtaken by the new technology of jet propulsion as well as the conclusion of the war in which - had it served - it would have undoubtedly made monkeys of its critics. It was originally a contender for the same specification that resulted in the Grumman F7F "Tigercat." The concept of the "flapjack" design was a "flying wing" with a very low wing chord/span ratio, which would allow it to out climb any other fighter, outmaneuver them at altitude if it couldn't outrun them, yet land on a carrier at a very low speed, which would add to safety in the most difficult maneuver a carrier-based airplane has to perform. It was proposed that the aircraft be powered by two R-2800s buried in the wings, driving very large propellers via extension shafts - these would put over 80 percent of the wing surface in their airflow, adding to performance. The concept was so radical the Navy called for a demonstrator to prove the concept. This appeared in 1942 as the V-173, which was smaller, made of wood, and had fixed landing gear. The V-173 was quite successful in its flight tests, and completely verified the claims made for the design. The XF5U-1 was ordered in 1943. However, as the war progressed in 1944, the aircraft lost priority as the Navy came to see that its F6F Hellcats and F4U Corsairs would fill most of its immediately-foreseeable needs, and what those two couldn't handle, the F8F Bearcat would. 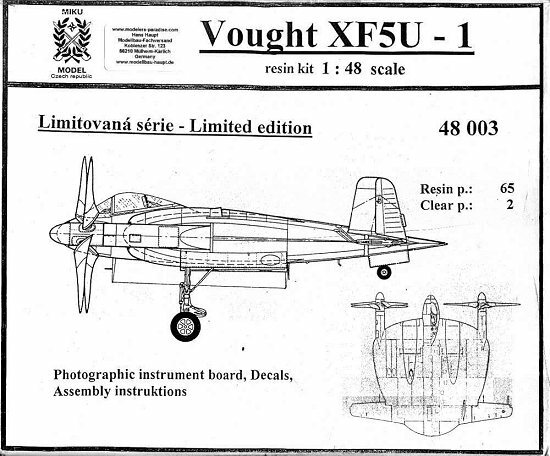 In the end, the XF5U-1 wasn't delivered until after the war. With all aircraft development now centered on jets and how to bring them aboard a carrier, the airplane was passed over in favor of the newer technology, and was never even flown before being scrapped in 1946. With a projected speed of 482 m.p.h. at 30,000 feet and good range, it would have undoubtedly been a stellar performer as a fleet defense fighter had it gone into production. 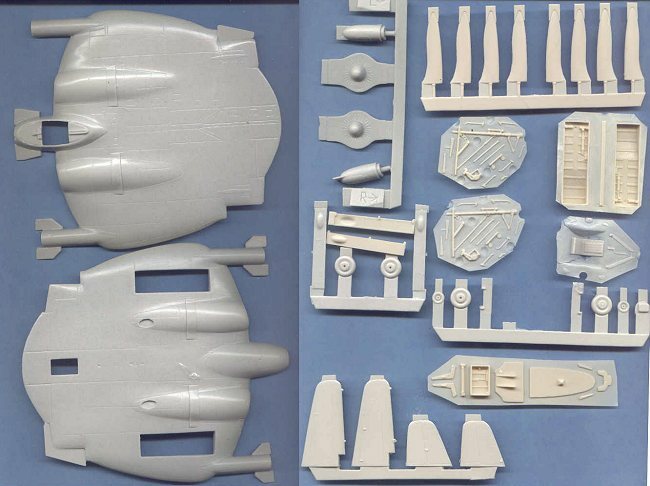 There was a 1/72 scale injection-molded kit of this strange airplane produced by Hasegawa a few years ago (which has been reissued and is currently available, Ed), and Sword put out the V-173 demonstrator a year ago, in the same scale. To date, this is the first kit of the "Flying Flapjack" in 1/48. It is produced in resin by Miku Models of the Czech Republic and has been available since this past summer. With 65 resin and 2 clear parts, the kit provides everything needed to produce a model. However, this is not the kit you might think of when you hear the words "Czech resin kit." It is not a SPIN model, or a Ciro kit, both of which are excellent, state-of-the-art companies. In fact, this kit reminds me of resin "garage kits" of about ten years ago: the fit is problematic with only some test-fitting, the panel lines are heavy, and there is quite a bit of scratchbuilding that will be necessary in such areas as the cockpit and the engine intakes. As well, the propeller blades will need re-shaping and filling to get their correct shape. The landing gear is all resin and also tall and stalky, which is not a good combination. I wish this had been done in white metal for added strength over the years. Obviously, from what has been said above, this is a kit one which the advanced modeler can demonstrate his advanced talents, with a result that will definitely get second looks from anyone who sees it at a show. All that said, it looks as though it will make up into an accurate model of this exceedingly-strange airplane. And it's the only one available in 1/48. If you would like your product reviewed fairly and quickly by a site that has thousands of visits a day, please contact me or see other details in the Note to Contributors.